The assassination of Benazir Bhutto took place on 27 December 2007 in Rawalpindi, Pakistan. Benazir Bhutto, twice Prime Minister of Pakistan (1988–1990; 1993–1996) and then-leader of the opposition Pakistan Peoples Party, she was first woman Prime Minister of Muslim world. She had been campaigning ahead of elections scheduled for January 2008. 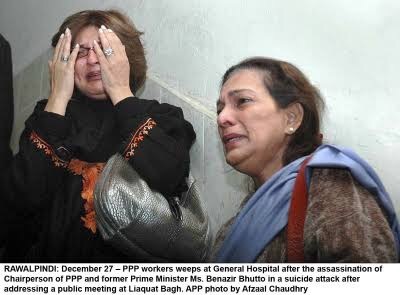 Following the suicide attack in the Rawalpindi city of Pakistan, an unconscious Benazir Bhutto was taken to the Rawalpindi General Hospital where her close aide and media member Ms. Farahnaz Ispahani was also present. The Attack witness Ms. Farah Ispahani, member of Benazir Bhutto’s media team, on ‘The Bryant Park Project’. Next Entry Farahnaz Ispahani book “Purifying the Land of the Pure” won a German Peace Prize at the Karachi Literature Festival 2017.